Whether it's an indulgent break or a life changing adventure, Queensland's Tropical North offers an unforgettable experience. Few places on Earth can boast such unique natural attractions, like the Great Barrier Reef and superb World Heritage listed tropical rainforests, within easy reach. Traveltrain Holidays long distance train network can take you there. Queensland's outback is larger than life. Learn about Aboriginal culture, indulge in the ever-changing landscape, or soak up the hospitality. From the historic towns of Longreach and Winton to the charm of Charleville - you'll be surprised just what you can see in this ancient land. And what better way to travel the wide open spaces, than Traveltrain Holidays long distance train network. Queensland Railways Westlander train is the most comfortable way to travel between Brisbane and the towns of South-West Queensland. The fully air-conditioned train offers comfortable seating accommodation and complimentary at-seat snack packs are delivered at meal times throughout the journey. Schedule: The Westlander departs Brisbane Roma Street station two evenings each week and travels up the range to Toowoomba, then through the night to the western towns of Roma and Charleville. On the return journey, the Westlander departs Charleville in the afternoon for the overnight trip back to Brisbane arriving Roma Street station arriving late the following morning. Co-ordinated buses connect Charleville to Cunnamulla and Quilpie. Advance reservations are essential for all travel on The Westlander. Leaving Townsville, The Inlander heads more than 970km west through Queensland's rugged inland past the remote heritage townships of Charters Towers and Cloncurry to the Mining town of Mt Isa. The train offers comfortable seating accommodation and complimentary at-seat snack packs are delivered at meal times throughout the journey. Schedule: Twice weekly departures from Townsville on Sundays and Thursdays and from Mount Isa on Mondays and Fridays. 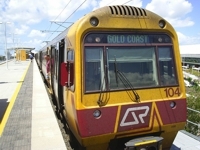 Queensland Rail operates frequent, fast electric trains between Brisbane Airport, Brisbane Central, Brisbane Roma Street and Gold Coast stations. These trains whisk you quickly right from the airport to downtown with a minimum of fuss. Travellers to the Gold Coast have the choice of a number of stations - Helensvale, Nerang, Robina and Varsity Lakes - each has co-ordinated bus connections that meet trains at the station and take you to the coast and surrounding suburbs. Schedule: Trains depart the airport regularly (every 15 to 30 minutes) for the journey to downtown Brisbane and the Gold Coast. There is no need to book in advance, just buy your ticket at any station. Standard Translink fares apply - and bus connections are included in the fare. Whether you're travelling for business or pleasure the Tilt Train is a comfortable and convenient way to access South Queensland's coastal destinations. Travelling between Brisbane, Bundaberg and Rockhampton, the Tilt Train fleet features personal entertainment, power points for laptops and computer games, a club car and dining service, business and economy-style seating. Meals can be purchased on board. Schedule:The Tilt Train departs daily. For a realistic up front view of Queensland's captivating outback, take a trip from Brisbane to Longreach on the Spirit of the Outback. This 24 hour journey travels west from Rockhampton, passing through the heritage towns of Blackwater, Emerald and Barcaldine before arriving in Longreach, home to the Australian Stockman's Hall of Fame and Qantas Founders Museum. Accommodation includes sleeping berths (for one, two or three people) or seats. The sleeping berths feature a range of amenities to ensure a comfortable journey, including bedding, wash basins, wardrobes and access to shower facilities. Meals can be purchased on board. Schedule: Twice weekly departures from Brisbane (Tuesdays and Saturdays) and from Longreach (Mondays and Thursdays). Experience a ride on the wonderful French-made "Purrey" Steam tram at Rockhampton's Archer Park Station Museum. This beautifully restored remnant of Rockhampton's little known steam tramway network is one of very few of its kind anywhere in the world. Schedule:Steam Trams operate every Sunday afternoon. Experience some of Queensland's railway history on the Rosewood Railway. Preserved steam locomotives and railmotors including the iconic 'Red Fred' shuttle to and fro over an original country branch line railway that's an easy day trip from Brisbane. Schedule: Trains operate from Rosewood to Perry's Knob and from Kunkala to Cabanda on the last Sunday of every month. Whether you're travelling for business or pleasure the Spirit of Queensland is a comfortable and convenient way to access Queensland's coastal destinations. Travelling between Brisbane and Cairns, the 'Spirit' fleet features personal entertainment, power points for laptops and computer games, a club car and dining service. The Spirit of Queensland offers business-style seating for all passengers, and 'Rail Beds'. Meals can be purchased on board. Schedule: The Spirit of Queensland departs five times weekly from Brisbane and Cairns. Travel by fast, comfortable electric train from Brisbane to Nambour and Gympie on the Sunshine Coast. Schedule: Trains operate every day from Brisbane's Roma Street and Central Stations, with up to twelve trains each day travelling to Nambour, and two trains daily travelling through to Gympie North. A must-do for visitors to Cairns and North Queensland, this famous day tour by rail attracts more than half a million passengers annually. Passengers view the breathtaking beauty of deep mountain gorges, lush tropical foliage and spectacular waterfalls all from the comfort of your vintage railway carriage. Schedule: Departs twice daily from Cairns. Fondly referred to as "the old tin hare", the Gulflander is one of the world's last great characters of rail travel. This grand old railmotor escorts passengers on an enchanting and historic journey through the rugged Gulf country of North West Queensland from Normanton to Croydon. The Savannahlander is a unique train journey which begins in Cairns. It is one of the great rail experiences of the world as it rattles its way from the coast, up the scenic Kuranda Range including stops at Barron Falls and Stoney Creek, through World Heritage listed rainforests to Kuranda. It then continues on through the savannah to outback Australia. The Savannahlander is also a unique way to see the Chillagoe Caves, Cobbold Gorge and the Undara Lava Tubes. Schedule: Weekly departures (Wednesday out from Cairns, returns Saturday). 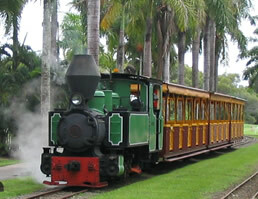 The line used by the Bally Hooley Steam Railway was once used to transport sugar and passengers between Mossman and the wharf at Port Douglas. The line was formally opened on the 1st of August 1900 and trains where operated by the Douglas Shire Council until 1957. Today, the BSR operates passenger trains hauled by restored cane locomotives on 4km of track between Port Douglas and St Crispins. Australia's newest tramway, Gold Coast's G:Link tram service opened in July 2014. 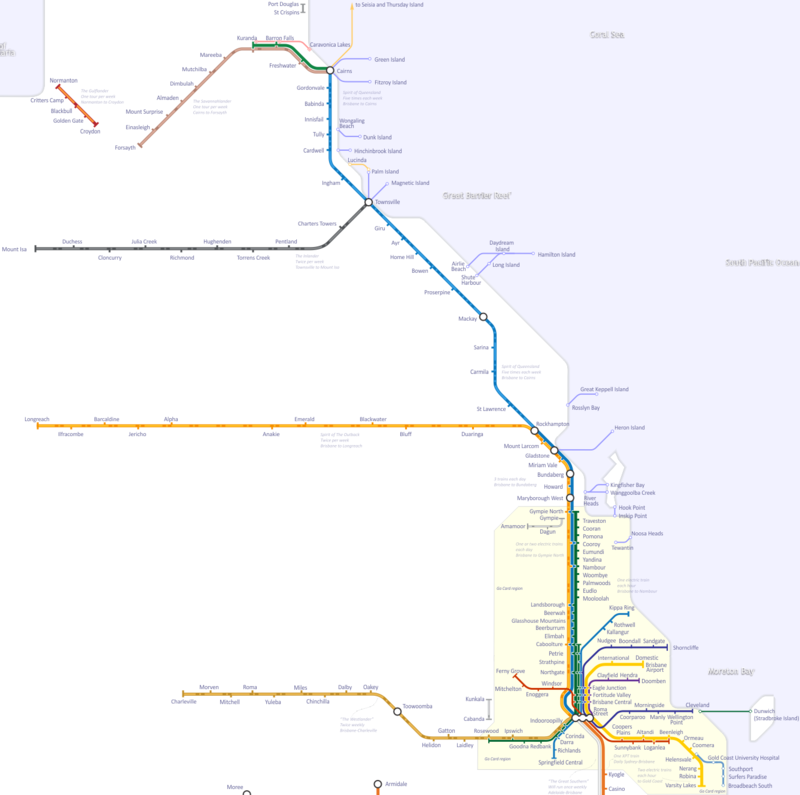 From Helensvale in the North, where it connects directly with trains to and from Brisbane, the G:Link tram line runs through Southport and Surfers Paradise to Broadbeach South. Schedule: Services run every 7 and a half minutes throughout the day on weekdays and every 10 minutes on Saturdays and Sundays. Trams run late into the early hours on weekends. The end to end journey is 45 minutes. The historic Ravenshoe Steam Railway is a unique attraction for visitors to Ravenshoe. 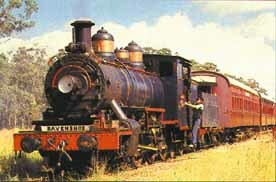 A ride on this steam train is a great way to see the area as it journeys 7km north along the former Cairns to Ravenshoe railway to Tumoulin siding. Schedule: Steam trains depart Ravenshoe Railway Station every Sunday at 1.30pm, returning at 3.00 pm. You should check with the Ravenshoe Steam Railway beforehand to confirm that the service is running on the day of your visit.